What are the Gas Giants? Giant planets are planets of massive size and are usually composed of low-boiling-point materials. Jupiter is perhaps the solar system's most famous gas giant. Any planet of massive size qualifies to be a giant planet. Such planets are mainly made of low-boiling-point materials such as ice and gases although giant solid planets can exist. Giant planets also go by the name jovian planets, and they are Jupiter, Neptune, Uranus, and Saturn. The phrase gas giant was first used in 1952 by James Blish, a science fiction writer. Jupiter's mass is 2.5 times the total mass of the rest of the solar system's planets and one-thousandth the mass of the Sun. Jupiter is a gas giant, being majorly made of hydrogen while a quarter of its mass is helium. The planet's rapid rotation has resulted in its oblate spheroid shape. 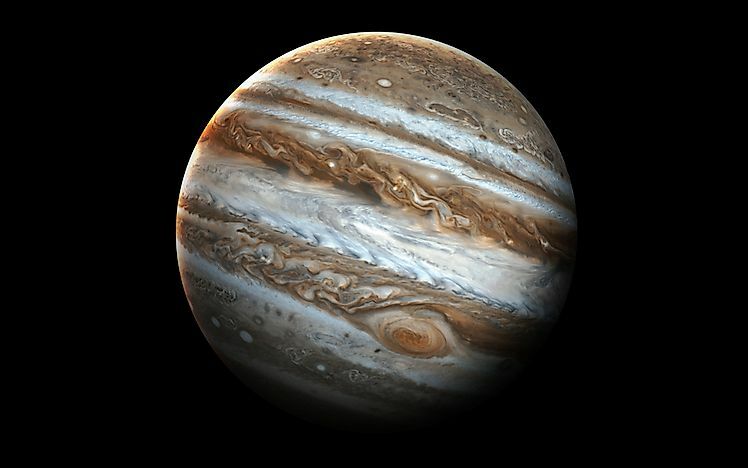 Jupiter's diameter at its equator is 88,846 miles. Jupiter has attracted interest from astronomers since ancient periods, and the Romans gave it the name in honor of their god Jupiter. The planet possesses at least 69 moons and the largest named Ganymede has a diameter larger than the diameter of Mercury. Saturn, like Jupiter, is a gas giant also composed of helium and hydrogen. Saturn is notable for its ring system which features 9 continuous primary rings in addition to three discontinuous arcs. The planet is listed as having 62 moons, 53 of which have official names. This figure excludes the hundreds of moonlets which make up the rings. The biggest of Saturn’s moons is Titan which ranks as the second-largest in the larger Solar System. Saturn is about 30% less dense than water. Saturn and Jupiter, when combined have 92% of the planetary mass of the solar system. Uranus is categorized as an ice giant, and although its predominant composition is of hydrogen and helium, it has more "ice" including methane, water, and ammonia. Uranus was named in honor of the Greek god of the sky named Ouranos. The planet features 27 moons, a magnetosphere, and a ring system. Its minimum temperature is estimated at -223 Degrees Celsius making it the coldest planetary atmosphere. The planet orbits the Sun every 84 years, and its average distance is 20 AU from the Sun. The planet's mass is about fourteen and a half times the mass of the Earth. Neptune's mass is seventeen times the mass of the Earth. The planet is recognized as the only one located by mathematical prediction and not by empirical observation. Johann Galle was the first man to identify the planet via telescope on September 23, 1846, and he relied on the predictions of Urbain Le Verrier. Its moon Triton, which ranks as the largest, was observed shortly after although it was not until the 20th century that its 14 moons were identified telescopically. Neptune's distance from Earth makes it seem to be of small size, and this makes it hard to study it using Earth-based telescopes. Advanced telescopes with adaptive optics have made it easier to get additional observations from afar. The atmosphere of Neptune has visible and active weather patterns while the temperatures at its center are estimated to be 5,100 Degrees Celsius. Which Industry Emits the Most Greenhouse Gas? What Are The Ice Giants?